Heat the oven to 190 degrees. Heat 1 tbsp of the oil in a large pan until very hot. Season the aubergines and fry until golden, about 3 minutes per side. Cook in batches, adding extra oil as needed. Set aside on kitchen roll to drain. In a pan, heat the other 1tbsp of oil and add garlic and onion. Cook for a few minutes until golden then add the tomatoes. Season and simmer for 10 minutes until thickened. 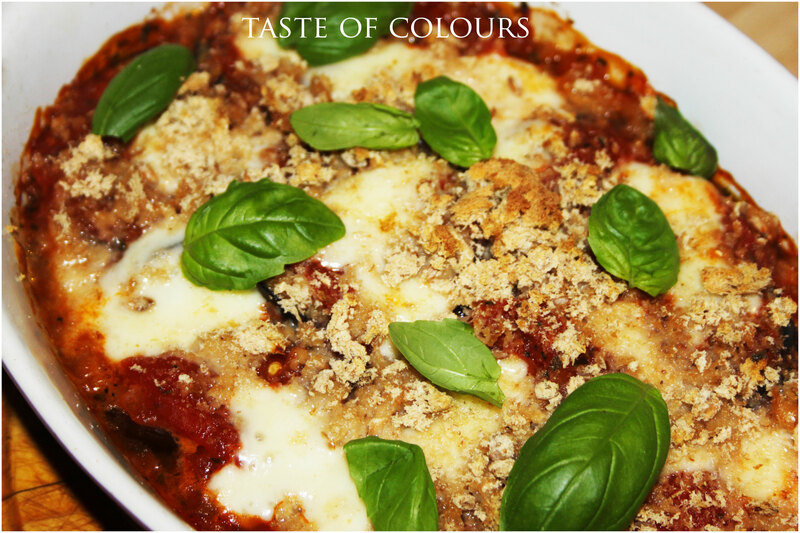 Layer the aubergine slices, tomato sauce, mozzarella and basil in a baking dish. Blitz the foccacia into chunky crumbs and sprinkle on top, then bake for 25 minutes or until golden and bubbling. 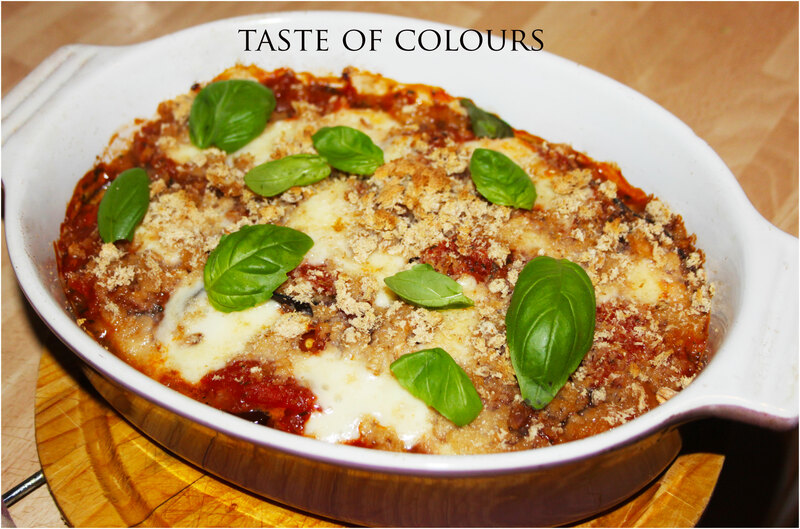 Looks great with all that color from the tomatoes and basil! Loved the photos and recipe! What are aubergines? This looks delicious! 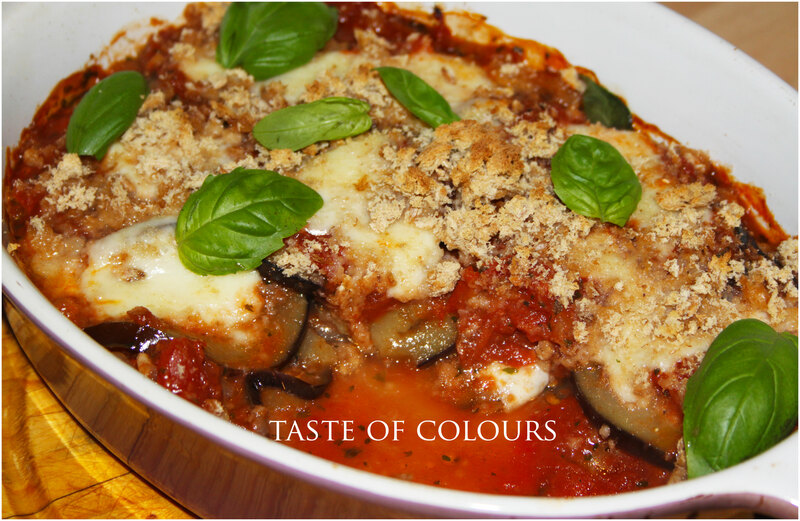 I’m not a great aubergine fan – I can’t seem to cook them well, they seem to be rubbery or just a bit “icky”.. but I love zucchini and often replace it in recipes. Any suggestions on how to cook aubergine? Susan, It also helps if you bake them at very high temperature. Pop 1 inch slices of aubergine in a preheated oven at 220C and place a tin foil on top. Leave for 20 minutes, take the foil off and leave another 5-10 minutes or until they get a golden brown colour and if poked with a fork they have a soft buttery texture. Works for me every time! Good luck!